It is estimated that about 500,000 homeless cats roam the streets just in South Australia. Cats breed quickly and are adaptable, resulting in an increased number of stray felines. The life expectancy of a homeless cat is said to be 2 to 4 years compared to 13 years for a cat with a stable home. 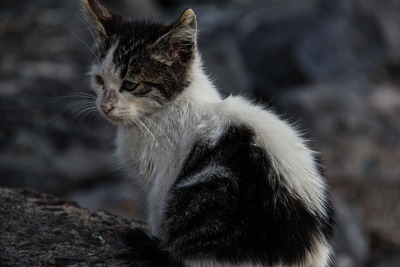 Many homeless cats lead miserable lives and they can spread disease and parasites to owned cats. Diseases such as cat scratch fever, ringworm and toxoplasmosis can be spread to humans. Where do stray cats live? A stray or homeless cat may live on its own and move around a neighbourhood in search of food and a safe place to sleep. It may need to keep moving if there are other cats which have already claimed the area as their territory or if there are dogs around. Some stray cats form a colony, set up 'camp' and have a territory they will defend as their own. 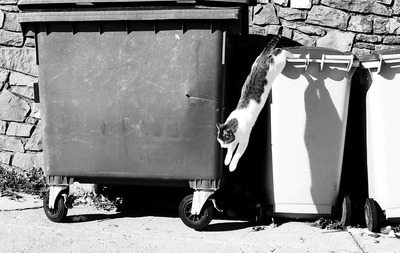 Homeless cats will spend much of their day scavenging scraps from garbage bins or stealing from the bowls of domestic pets. Some will score handouts by mewing until a kind hearted person puts out some food. Strays often kill wildlife such as birds, small animals and lizards to survive. Is it okay to feed a stray cat? People who feed a stray usually have good intentions. They hate the idea of a cat being hungry so they feel they are helping it by regularly providing food. Sometimes word spreads among stray cats and more cats turn up looking for food. As responsible cat owners are aware, a cat needs more than food and water to keep it in good health. He/she needs a safe clean place to sleep. Cats also need regular vaccinations, health checks and dental care. A cat needs to be wormed regularly and treated for fleas. It needs to be microchipped so it can be returned to its owners if it becomes lost. Why should male cats be desexed? While it is obvious why a female cat needs to be desexed it may seem an unnecessary expense to get male domestic cats desexed. After all they can't get pregnant. However, an undesexed male will get into many more fights than one that has been desexed. This will result in injuries and perhaps infections and abscesses at the site of wounds, resulting in additional vet bills. Undesexed males will wander further and will spray to mark their territory. This will make you unpopular with neighbours when your cat sprays urine over their front porch. These males also make an awful noise when they fight for the attention of available females. How quickly can cats breed? 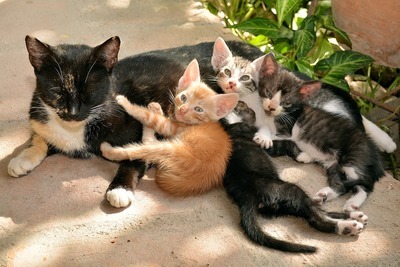 A single female cat can give birth to as many as 41 kittens in one year. If nothing is done to stop this pattern of breeding, this cat and her offspring may produce up to 3,822 cats over 4 years. That is a lot of cats. How can you tell if a cat is a stray? A cat with a home is usually in good health and looks well groomed. It may be comfortable about being handled but there are some cats that have a home but are shy around strangers. A microchipped cat will have the letter M tattooed in one ear. If he/she has been desexed there will be a blue/green tattoo like a circle with a line through it in the ear. The cat is owned but could be lost. Some cats are not microchipped but are wearing a collar with an identification tag. If the details are current this should enable you to contact the owner. What can you do if you find a stray cat? A stray cat can be taken to a vet, RSPCA or Animal Welfare League where they will check to see if it is microchipped. If they are unable to locate the owner they may be able to find a new home for the cat through their adoption process. Cats which are unsuitable for adoption will be euthanased. You may need to borrow a 'humane' cat trap from your local council or RSPCA in order to catch the cat and transport it to an appropriate place. It is important to only use an approved cat trap which can not cause an injury to the cat and ensure the cat is not left in the trap for too long. Your local council will be able to provide advice on how to encourage the cat to enter the trap and the rules governing trapping of cats. In some areas an authorised person from the council or RSPCA will be available to collect the cat. If the cat is a lactating female you will need to follow her back to her 'nest' so you can take the kittens as well. Stray or homeless cats can become a big problem. Cat owners can avoid contributing to this problem by ensuring they get their cats desexed (unless they are breeding cats) and microchipped for easy identification. Keep your contact details current in case you do lose your cat.